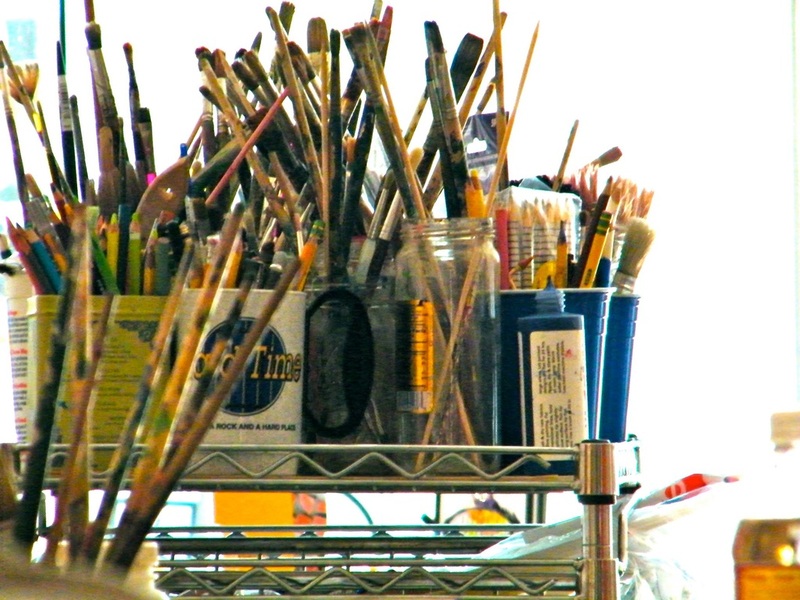 Art Classes at Habitat Gallery & Studio! Georgia Amar’s Habitat Gallery & Studio offers its years of art experience to assist the artist, from the newcomer to those ready to take the next step, with art classes in an intimate gallery setting in the heart of Denver’s Art District on Santa Fe! Classes taught by Georgia Amar or instructor Lindsey Hubbell. Classes are once per week for five weeks. "Rolling schedule" means pick a start date and go for 5 classes, flexible dates. Cost is $225 for each five sessions. No tax. Medium: Painting. All ages and experience levels. Small class sizes, no more than 10 per class. E-Mail us at GeorgiaAmar.FineArt@Gmail.com and we'll send you a registration form. "What foods don't you like?" Georgia Amar asked her class of young art students. "Carrots!" declared one. "Broccoli!" said the next. "How about chick peas? "asked the instructor. "Yuck!" all the kids replied. The next day at the gallery, after the kids had already devoured their boxed lunches of packaged meat sandwiches, Cheeze Whiz-type products with crackers, and the omnipresent sugar juice containers by 9:30 AM, Georgia called the group together for lunch at noon. The meal for the day was to be carrots, broccoli and chickpeas. All the art students aged 7 - 14 participated in the food preparation. Carrots and broccoli were boiled; the chickpeas dry heated in a pan like Georgia learned to do in Morocco. All were then covered with lemon, cumin and pinch of salt and pepper. It worked. The kids loved the food. The same thing continued throughout the week-long session, except that the boxed lunches were ignored. By week's end the kids were demanding the recipes for the healthy and tasty lunches! Parents were coming in wondering how and why their kids became interested in healthy food and were demanding that their parents make the recipes at home. Many of the adult students of Georgia Amar are members of The Children's Hospital Volunteers, a special group of concerned and caring women that are active in charitable work. These volunteers were moved by a talk by Dr. Phillip S. Zeitler, Endocrinologist at The Children's Hospital in Denver, on the consequences of childhood obesity. Presto, a concept for a book is born, and "Plates of Change: Reshaping Your Life One Meal at a Time" is created by The Volunteers of Children's Hospital. Plates of Change is for children and their parents and contains recipes of food and for a healthy lifestyle. 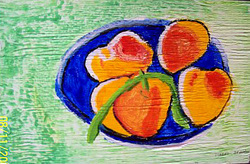 The book has pages for notes and is adorned with images of food painted by the young students of Georgia Amar. This coming First Friday Art Walk on Santa Fe Drive The Volunteers of Children's Hospital will be in attendance at Georgia's Habitat Gallery and Studio, 828 Santa Fe Drive, and will be providing complimentary tasting of recipes from Plates of Change from 5:30 to 7:30. Plates of Change will be available for sale at $17.95 with all proceeds going to the benefit of the Insulin Resistant/Type 2 Diabetes Clinic of The Children's Hospital. Georgia Amar will donate 10% of all sales of her artwork that evening to the same cause.